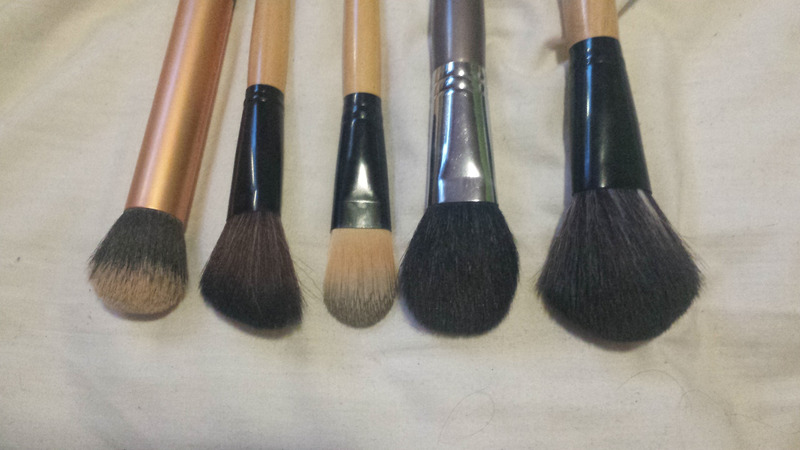 Beauty By Shannon: What's in my travel makeup bag? I'm going off to Toronto in a few hours, and i'll be there until monday late afternoon. And while I'm there, I'll be doing some public speaking and all that jazz, so this is my "I want to look professional and alive" makeup!! 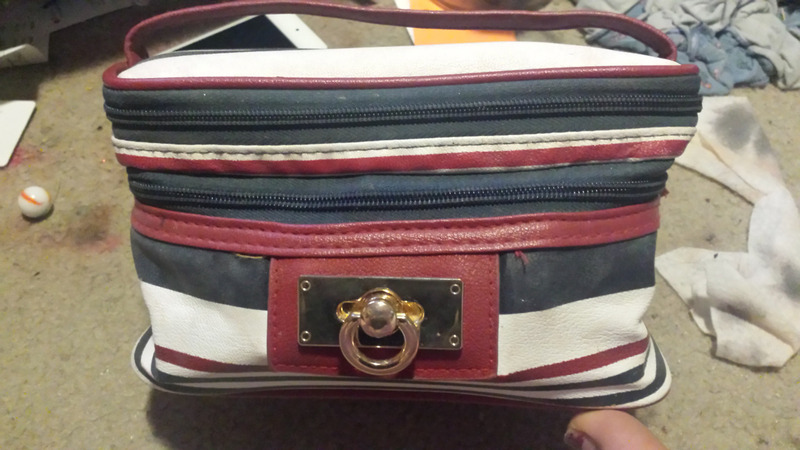 This is my travel makeup bag!! It's just a basic two story bag!! 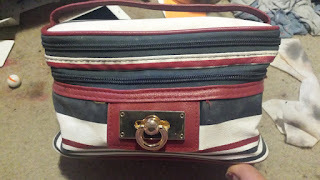 I like this bag, because it's big enough to fit my Z pallet, and it fits everything I need in it, it also has the top zippered part for my brushes to be safe and not all bent and beaten up!! These are my face brushes I use every day, From left to right, we have a Buffing Brush for my foundation, a angled cheek brush for bronzer, a small flat foundation brush I use to pat out my under eye concealer, a fluffy blush brush, and a big powder brush! These are my every day eye brushes!! 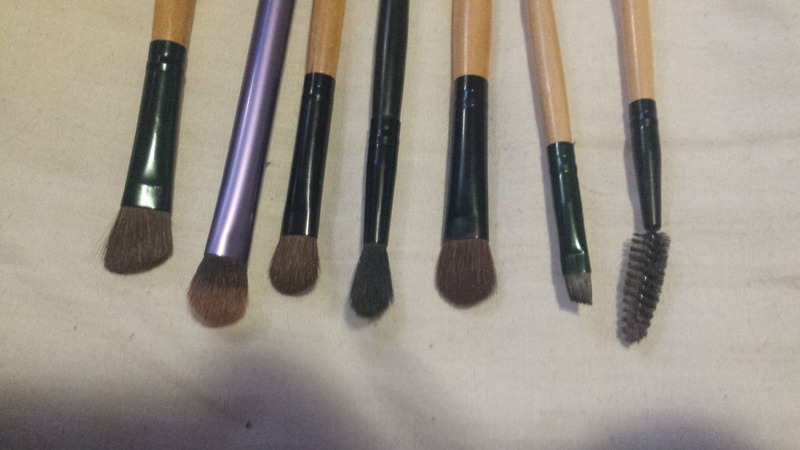 From left to right: A angled fluffy for setting my eye primer/highlighting my brow bone, a fluffy blending brush, a smaller eye lid brush for the inner corner, a thin pencil brush for work on my hood, a bigger eye lid brush for my outer eye lid, an angled brow brush, and a spoolie! 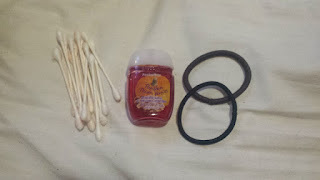 I always keep cotton swabs in my travel makeup bag (i'm known to cough or sneeze while my mascara or liner is drying it's TRAGIC) I ALWAYS keep hand sanitizer with me every where, and my makeup bag is no exception! I have long, long hair. I keep 2 hair ties on my wrist every day, and I have at least two in every bag!! Moving onto makeup! 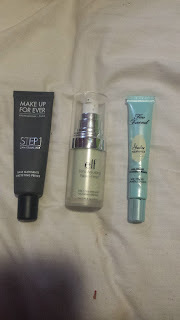 These are my tried and true primers. 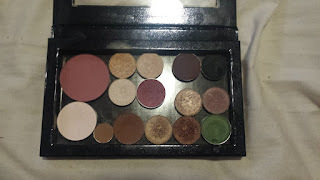 I use the elf green primer on my cheeks and on the edges of my nose to correct redness, then I pat the Makeup Forever mattifying primer onto my forehead, between the brows, nose, chin, and smile lines. I usually apply my eye primer while I do my face primer. So I'll squeeze out a small amount of Too Face Shadow Insurance and pat that onto my lids! 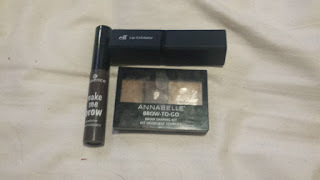 Here is my base products! I'm testing out the Maybelline Fit Me foundation stick, and I'm still not sure how I feel about it. I'm bringing my tried and true Makeup Forever Mat Velvet+ Foundation. It oxidizes to a more orangey shade on me, but with blending it down my neck, and the way I keep my hair, its not noticeable. But I always mention that just in case! 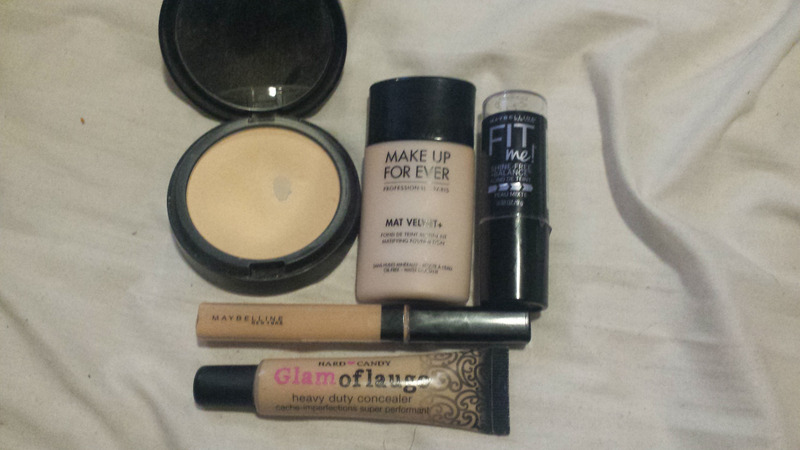 Then we have my favourite concealers! Maybelline Fit me, which I love for my cheeks. And Hard Candy Glamoflauge, which I use a PIN HEAD amount of to cover BOTH undereyes. Then we have my Sephora brand Matte Perfection Powder foundation, which I use to set my whole face! This is my Z pallet, I'v recently spoken about this. So I wont get too in depth. But after setting my face, I'd go in with one of the blushes in here, and the highlights. I also go in and do eye shadow after I do my blush and highlighting!! Next we have my two current mascaras! 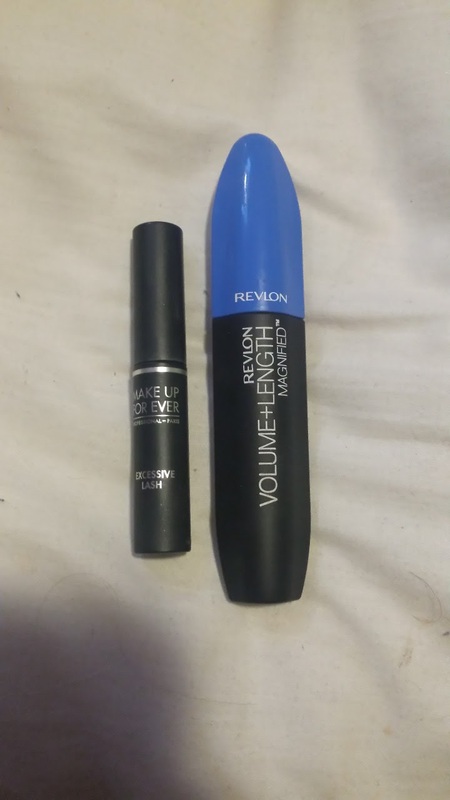 I'm using the Revlon one on my upper lashes, and the Makeup Forever one on my lower lashes! They both give me the drama I love, and neither smudge or flake! This isn't anything special, y'all know my brow routine already. 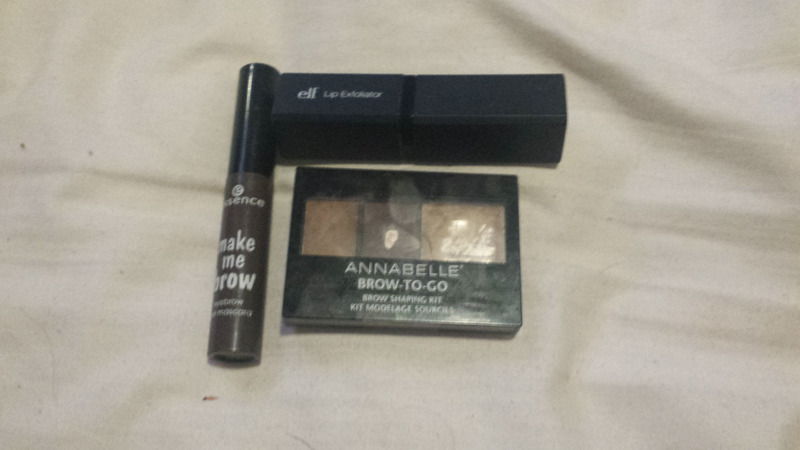 But I have my Essence Make me brow, and my Annabelle brow to go kit. Also, just in case because I'm wearing matte lipsticks, I threw in ELF lip exfoliator! Lastly, we have the lip products i'm bringing!! 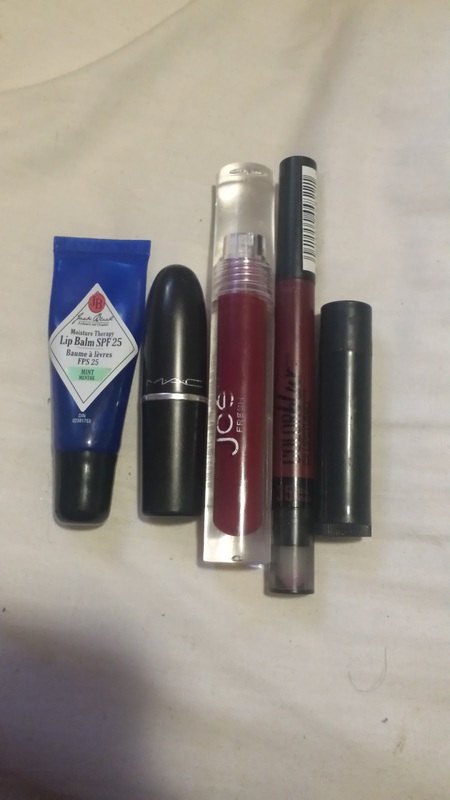 I'm bringing my mint Jack Black lip balm, MAC Rebel, A Joe Fresh Lip gloss in Wine (It's a sheer tint!! Not super vampy at all!) Maybelline Colour blur in Plum me? I think that's the name. And LUSH's Santa baby which is my all time favourite lipstick! That's all that's in my travel makeup bag for this weekend!! What do you think?